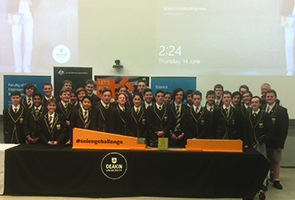 When 32 of our best Year 9 and 10 Science and Maths students competed in the Annual Science and Engineering Competition at Deakin University in Geelong earlier this year, little did they know where this would lead. After winning the competition with the best score in the state the boys have landed on their feet and have now been invited to compete in the National Science and Engineering Challenge for three days in Darwin in October. This is a fantastic opportunity for the boys to showcase their science and engineering skills in a competition against the winners from the other states. After a successful application to the federal government for funding, Whitefriars College has succeeded in securing over $22,000 to financially support our students and their families and ensure all students that want to attend, are able to attend.